Preheat oven to 220°C, gas mark 7. Place a large ovenproof and flameproof roasting tin into the oven to preheat. Peel and slice 1 carrot into bitesize pieces. Remove roasting tin from the oven and add 400g pack chilled Waitrose Ready To Roast Parmentier Potatoes, the carrot and toss together to coat with the melting butter from the potatoes. Return to the oven and roast for 15 minutes. Remove from the oven, toss the vegetables then add 2 essential Waitrose Lamb Hand Cut Rack Cutlets and 1 large courgette, sliced. Return to oven for 15 minutes. 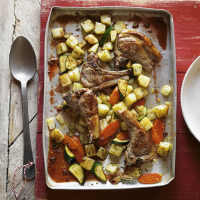 Remove lamb and vegetables from the tin and place on warm serving plates. Place tin on the hob on a low heat and stir in 2 tbsp Waitrose Redcurrant Sauce With Port into the pan juices with 1 tbsp boiling water. Allow to heat thorough and then drizzle over lamb and serve.